If you're having trouble swallowing the usual over-the-counter medicine when dealing with a bout of diarrhea, you may want to consider trying coconut. There's some scientific evidence that coconuts, which are used in traditional Mexican medicine as a folk remedy for gastrointestinal disorders, may help alleviate diarrhea. Consult your doctor if your diarrhea lasts longer than two days or you're showing signs of dehydration such as extreme thirst, dark urine or dizziness. Diarrhea has a number of causes, including bacteria, medication and chronic diseases such as Crohn's disease. In addition to the loose, watery stools, you may also experience abdominal pain or a fever with your diarrhea. Due to fluid losses, dehydration is a major concern in people with diarrhea, which is why stopping the frequent, loose movements is often part of the treatment plan. This is where remedies like coconut may be helpful. 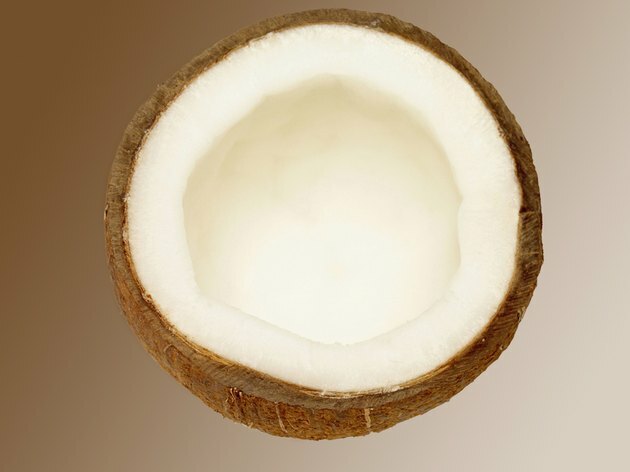 Coconut extract may help stop diarrhea, at least in rats. A 2010 study published in the Journal of Ethnopharmacology tested the effects of various plant extracts, including coconut, on diarrhea in rats. The study found that coconut extract inhibited the diarrhea by 30 percent to 57 percent. A 2005 study published in the same journal also found that coconut has antibacterial activity against common food-borne bacteria such as Shigella and Salmonella. While these studies indicate that coconut may play a role in alleviating diarrhea, human studies need to be conducted before claims can be made. In addition to possibly helping your diarrhea, coconut may offer other health benefits. The oil, which is rich in medium-chain triglycerides, may help lower bad cholesterol and raise good cholesterol. It also has antioxidant activity and may help prevent blood clots. In addition, coconut water is an excellent source of antioxidants and has antibacterial effects. While it's not certain that coconuts can stop diarrhea, coconut water is rich in electrolytes and may help you replenish fluid and nutrient losses. One cup of fresh coconut water has 46 calories, 2 grams of protein, 9 grams of carbs, 600 milligrams of potassium and 252 milligrams of sodium. The authors of a 2011 review article on coconuts published in the Asian Pacific Journal of Tropical Medicine report that the water is used as a form of treatment for those dealing with diarrhea. Are There Spices That Help to Stop Diarrhea?